A complex case presentation leads to a diagnosis of bilateral retinoblastoma. We all learned in our early medical training that, when you hear hoofbeats, you should not think of zebras. However, the following case highlights that, in the world of ocular oncology, particularly pediatric ocular oncology, there is the potential for zebras around every corner. A 4-year-old boy with history of persistent fetal vasculature (PFV) in the left eye (OS) was referred to us by his pediatric ophthalmologist, who was concerned about new onset amblyopia OS. At age 2 this child was diagnosed with Kawasaki disease, which resolved with treatment. During that treatment, the patient was referred for leukocoria OS. • A pediatric patient with PFV, Kawasaki disease, and leukocoria was referred for pediatric ophthalmology consultation due to concern about new onset amblyopia. • After significant functional and anatomic changes were noted on follow-up observation, the patient was referred for pediatric ocular oncologic consultation, during which multifocal retinal tumor involvement and advanced vitreous cells were recognized. • This case highlights the challenge when rare diseases occur in the setting of preexisting pathology. At that time, his examination was remarkable for asymmetric, bilateral cataracts, greater OS than in the right eye (OD). Examination by the pediatric ophthalmologist suggested prior inflammation with vitreous debris, but with no active inflammation or abnormality of the lens, and with minimal posterior vascular stalk, OS>OD (Figure 1). The child was observed with refraction and amblyopic management until 2 years later, when left exotropia was noted, along with increasing inflammatory vitritis. On referral to our center, his visual acuity was 20/30 OD and hand motions OS, dense vitreous opacities were present in each eye (OU) with involvement OS>OD, and bilateral cataract with vascular alterations consistent with PFV was present OS>OD. Pertinent history revealed no recurrence of Kawasaki disease and no family history of uveitis, pediatric malignancy, or enucleation. Figure 1. Right (A) and left (B) eyes with multiple peripheral retinal tumors, OS>OD; vitreous seeding OU, OS > OD; and PFV, cataract, and stalk OS>OD. On examination under anesthesia (EUA), the patient’s intraocular pressure (IOP) was 13 mm Hg OD and 12 mm Hg OS. Anterior segment examination revealed bilateral cataracts consistent with PFV, and bilateral retinal tumors with overlying vitreous seeding were present in the peripheral retina. Widefield fundus photographs, widefield fluorescein angiography, and bilateral quantitative A- and B-scan echography documented these clinical findings. Intraoperative laser was applied bilaterally to the retinal tumors. Pediatric consultation was obtained to determine whether there was active concern for Kawasaki disease. During this consultation period, high-dose oral steroids were utilized. A diagnosis of bilateral Reese-Ellsworth stage 5B (stage D by International Classification) retinoblastoma was made. A treatment course of three planned intraarterial chemotherapy (IAC) sessions using high-dose melphalan was begun with oversight by our pediatric oncology team. Significant improvements OU were seen beginning with the first IAC treatment. Treatments were performed at 4-week intervals with integrated EUA delivering bilateral large spot-size indirect diode laser. At the conclusion of three IAC treatments, the retinal tumor components showed marked regression with type 4 chorioretinal scarring. Persistent active vitreous seeding was present OS. Adjunctive intravitreal melphalan was delivered OS two times, using a standardized technique to minimize extraocular tumor dissemination. Over the next 2 years, tumor stability was documented without evidence of tumor recurrence or progression. Visual acuity initially improved to 20/25 OD and 1/200 OS (Figure 2). EUA was continued along with awake clinical evaluation. Neuroimaging studies were performed at initial evaluation and then every 6 months. Refractive correction, continuous eyewear use, and amblyopic therapy were continued. Figure 2. Right (A) and left (B) eyes after IAC OU and intravitreal chemotherapy OS. Visual acuity 20/50 OD, 1/200 OS. Both mother and son reported that the patient’s visual acuity was worsening, and progressive cataract was noted. Because of concern that prior gross vitreous seeding may have occurred, we delayed secondary surgical management 30 months from the last tumor treatment (laser application OU) and 36 months from the last chemotherapy treatment. At 36 months after last chemotherapy, the more advanced cataract OS was addressed with combined 23-gauge microincisional vitrectomy surgery (MIVS), vitreous cytology, phacoemulsification, and intraocular lens implantation (Figure 3). Cytology of the vitreous revealed calcific changes without evidence of tumor activity on the pathology from the first vitrectomy. Six months later, similar combined MIVS, phacoemulsification, and IOL implantation were performed OD along with vitreous cytopathology. Cytopathology revealed no active malignant cells. Figure 3. Right (A) and left (B) eyes after combined microincisional pars plana vitrectomy, phacoemulsification, and IOL implantation. Visual acuity 20/25 OD, 5/200 OS. At most recent follow-up, with ongoing EUA and awake clinical testing, the patient’s visual acuity was 20/20- OD and 5/200 OS. No active malignancy was identified, and IOPs remained stable at 13 mm Hg OU. This case highlights the challenge when rare diseases occur in the setting of preexisting pathology. This child was initially treated for Kawasaki disease, a rare inflammatory disease affecting the large vessels. Uniquely, Kawasaki disease manifests with optic nerve edema, vasculitis, and/or uveitis.1 A previous case report has described retinoblastoma with histologic confirmation in a child with active Kawasaki disease.2 Clinical pearls in this reported case included the presence of leukocoria, advanced retinal tumor involvement, and intratumoral calcification. PFV, previously known as persistent hyperplastic primary vitreous, is more commonly seen by the pediatric ophthalmologist or retina specialist than the ophthalmic oncologist.3-5 In the case presented here, PFV was recognized by the presence of leukocoria, cataract, and vascular alterations in the fetal vascular system within the posterior lens. The pediatric ophthalmologist recognized bilateral cataract without inflammatory alterations at presentation and elected observation. In this case, the clinical pearl was the progressive leukocoria, worsening visual function, and development of perceived “vitritis.” Retinoblastoma has been seen in patients with concomitant PFV, further complicating this complex presentation. In this patient, Kawasaki disease was recognized and treated at 2 years of age, prompting pediatric ophthalmology consultation. This consultation documented bilateral asymmetric PFV and established a baseline for observation. The patient was treated with refractive correction and amblyopic management. Fortunately, follow-up observation noted significant functional (vision loss) and anatomic (vitreous cells) changes, prompting referral for pediatric ocular oncologic consultation. Definitive evaluation for this child was made during EUA, during which multifocal retinal tumor involvement and advanced vitreous cells were recognized in the setting of preexisting PFV. Intraoperative studies were confirmatory for bilateral retinoblastoma with PFV. Neuroimaging and systemic workup were negative for nonocular involvement. We continued ongoing large spot-size transpupillary laser therapy targeted to the persistent tumor vascular activity and used intravitreal melphalan 20 µg OS for three cycles with a standardized protocol. Ongoing EUA evaluations showed tumor involution OU. The choice of IAC versus systemic chemotherapy remains a point of debate within the ocular oncology community. We use both systemic chemotherapy and IAC at our institution. In this case, the patient had excellent vascular access for IAC, advanced retinoblastoma with severe vitreous seeding, and asymmetric ocular involvement. This enabled us to provide bilateral IAC for a limited treatment regimen of three courses followed by targeted intravitreal chemotherapy for the persistent vitreous seeding within the advanced OS. At other institutions, systemic chemotherapy using one to four drugs (carboplatin, vincristine, etoposide, and/or cyclosporine A) would be given for three to nine cycles. In appropriate clinical circumstances, we use systemic chemotherapy alone as primary therapy, systemic chemotherapy as a bridge therapy followed by IAC, or systemic chemotherapy with planned enucleation. Intravitreal chemotherapy also remains controversial in our field. In this case, marked retinoblastoma tumor response in the retina OU with persistent vitreous seeding in the advanced eye allowed us to consider intravitreal chemotherapy, which ultimately enabled tumor control. Extensive discussion with the family and the pediatric oncology treatment team regarding the risks and benefits of and the alternatives to treatment is mandatory with this complex, life-threatening disease. In our case, after retinoblastoma tumor control, a decline in best visual function OU was seen on clinical examination. Progressive cataract was noted in both eyes without other functional or anatomic limitations of vision. In this setting, we have used combined MIVS and phacoemulsification with IOL implantation. Based on previous experience, we delay intraocular surgery typically for a minimum of 24 months from last active retinoblastoma treatment.12 In our experience, we have seen no cases of extraocular disease in eyes when treated retinoblastoma was managed in this manner. In all cases, we minimize the potential for viable tumor contamination by using valved trocars, sutured sclerotomies, and small-incision phacoemulsification. Additionally, we send all collected ocular fluids for tumor cytopathology. This combined approach maximizes visual recovery and anatomic stability and minimizes surgical complications. This case highlights the uniqueness of ocular oncology and pediatric retina care in the United States. For this child, three distinct diseases (Kawasaki, PFV, and retinoblastoma) played a role in his diagnosis and management. A wide armamentarium of both diagnostic testing and treatment options is essential in the best care of these complex diseases. Additionally, after tumor control, long-term treatment targeted at maintaining visual and anatomic function is crucial. In this case, the delivery of advanced retinal surgical techniques (MIVS, phacoemulsification, and IOL) enabled recovery of 20/20 visual function in the patient’s better eye, along with 5/200 ambulatory vision in the more advanced eye. 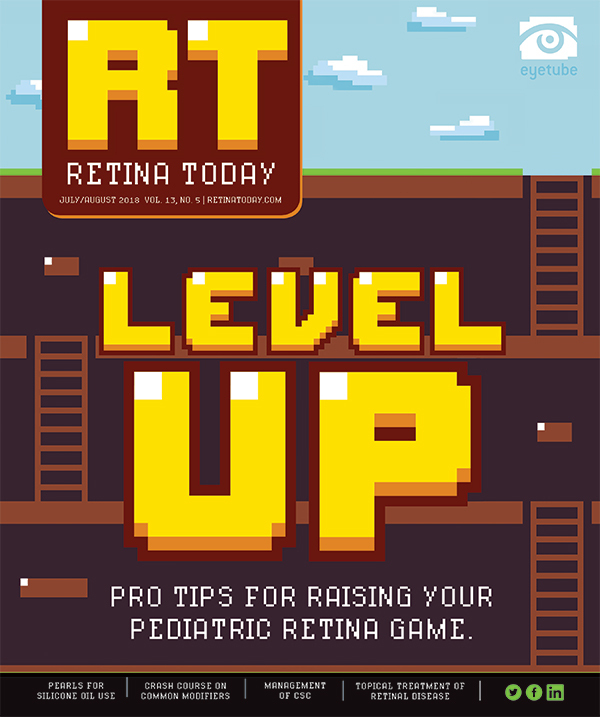 Ultimately, retina specialists deal frequently with life-changing (and, less frequently, life-threatening) diseases. Our patients deserve our best care always. Over the past 3 decades, no field of oncology has experienced changes like those that have occurred in retinoblastoma care.9 A disease that routinely killed every child is now treatable, preserving life in more than 98% of treated children, the globe in more than 90%, and functional vision in more than 80%. It pays to remember that advances have almost always started in controversy and ended in benefits for our patients daily. Ophthalmologists have led these advances at the genetic level, the diagnostic level, and the treatment level, and advances are likely to continue.6 Stay tuned. 1. Burke MJ, Rennebohm RM, Crowe W, Levinson JE. Follow-up ophthalmologic examinations in children with Kawasaki’s disease. Am J Ophthalmol. 1981;91(4):537-539. 2. Che Mahiran CD, Alagaratnam J, Liza-Sharmini AT. Leucocoria in a boy with Kawasaki disease: a diagnostic challenge. Singapore Med J. 2009;50(7):e232-234. 3. Goldberg MF. Persistent fetal vasculature (PFV): an integrated interpretation of signs and symptoms associated with persistent hyperplastic primary vitreous (PHPV). LIV Edward Jackson Memorial Lecture. Am J Ophthalmol. 1997;124(5):587-626. 4. Gulati N, Eagle RC Jr, Tasman W. Unoperated eyes with persistent fetal vasculature. Trans Am Ophthalmol Soc. 2003;101:59-64. 5. Walsh MK, Drenser KA, Capone A Jr, Trese MT. Early vitrectomy effective for bilateral combined anterior and posterior persistent fetal vasculature syndrome. Retina. 2010;30(4 Suppl):S2-8. 6. Murray TG. Retinoblastoma: clinical advances and emerging treatment strategies. London: Future Medicine; 2013. 7. Villegas VM, Hess DJ, Wildner A, Gold AS, Murray TG. Retinoblastoma. Curr Opin Ophthalmol. 2013;24(6):581-588. 8. Henry CR, Berrocal AM, Hess DJ, Murray TG. Intraoperative spectral-domain optical coherence tomography in Coats’ disease. Ophthalmic Surg Lasers Imaging. 2012;43:e80-84. 9. Scelfo C, Francis JH, Khetan V, Jenkins T, Marr B. An international survey of classification and treatment choices for group D retinoblastoma. Int J Ophthalmol. 2017;10(6):961-967. 10. Vajzovic LM, Murray TG, Aziz-Sultan MA, et al. Supraselective intra-arterial chemotherapy: evaluation of treatment-related complications in advanced retinoblastoma. Clin Ophthalmol. 2011;5:171-176. 11. Shah NV, Pham DG, Murray TG, et al. Intravitreal and subconjunctival melphalan for retinoblastoma in transgenic mice. J Ophthalmol. 2014;2014:829879. 12. Miller DM, Murray TG, Cicciarelli NL, Capo H, Markoe AM. Pars plana lensectomy and intraocular lens implantation in pediatric radiation-induced cataracts in retinoblastoma. Ophthalmology. 2005;112(9):1620-1624.